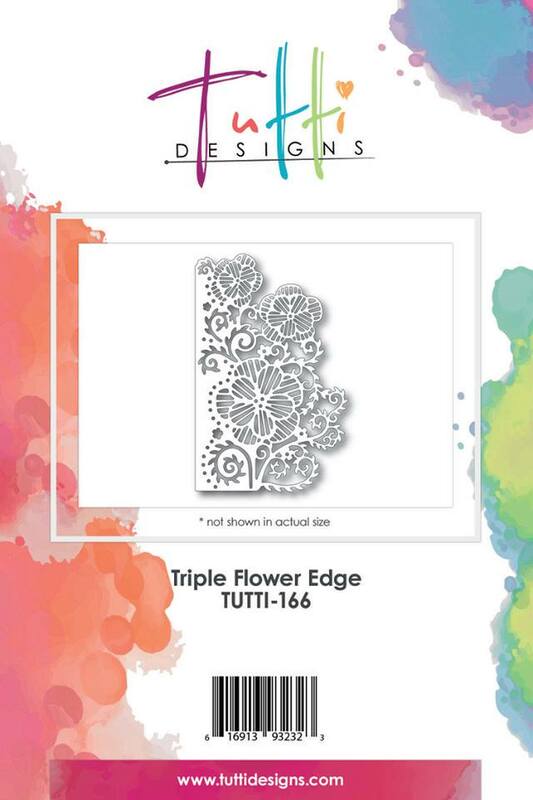 Welcome back every Tuesday for another one of my postings using a gorgeous Tutti Designs dies like this beautiful Triple Flower Edge which is shown below on my card. Isn't this flower die gorgeous with the beautiful leaves and flowers. I cut this die out of white/gold shimmer paper and glued it on this patterned paper. I stamped the sentiment and used 3mm flat back white pearls on the flowers. I added a square frame around the patterned paper and finished the card with May Art coral ribbon with a pearl brad in the center. Reminder to visit the Tutti Designs Blog, Tutti Designs Facebook and the Tutti Designs Pinterest to see what our other designers have created for you. I would appreciate a comment and if you have any questions, don't hesitate to ask. Simply beautiful Nancy! Love that sentiment & pretty ribbon bow! Beautiful creation that will certainly bring a smile!! Oh, I really love seeing this in the soft pink and white!! So elegant!